The student population at Ridgecrest Academy comes together every month to celebrate peers who have gone above and beyond in making the school a great place to be. In March, they unveiled something brand new. This special award will be given to a student, chosen by classmates, who exemplifies the Ridgecrest Academy spirit of believing in yourself. Inspiring words grace this dynamic painting, but even more inspiring is what will be on the back. The plan is to add the signature of each recipient, building a permanent roster of exceptional young people that will hang at Ridgecrest Academy long after they have graduated. We’re proud to congratulate the first winner: Anthony Washington. Photo: “Believe in…You. You are great. 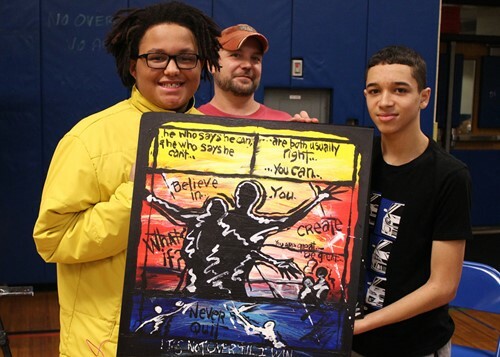 Be great.” Winner Anthony Washington with artist SBA Eric Warren and student Gabe Collazo.